From This Side of the Pond: So Long 2013, Hello Hodgepodge! So Long 2013, Hello Hodgepodge! Happy New Year! There's no party like a Hodgepodge party! Add the link to your answers and then be sure to go mingle with the other guests...10, 9, 8, 7, 6, 5, 4, 3, 2, 1-Happy Hodgepodge! 1. Times Square is the setting for the infamous ball drop signaling the start of a brand new year....when did you last 'drop the ball' on something? I'm sure there are many little balls dropped on a monthly basis around here, given that my memory is not what it used to be. One thing that came to mind was a big platter of hors d'oeuvres I'd made for a gathering which I never got out of the frig. There was plenty of food without, but ugh! I hate when I do stuff like that. Exercise. It took me a while to find my rhythm, but I am all in now. Shhh...don't tell anyone, but I like boot camp. I fall in the middle on this one. So often we're inspired by something or someone when we're not necessarily looking to be inspired. But...there are also seasons in life where inspiration is lacking, and the world feels gray and flat. In those moments I'm all for grabbing a club and hunting it down. Maryland blue crabs steamed, picked, and eaten by the river in Annapolis. Add in some of my favorite people, and voila~perfection! Wait...it was about 110 degrees with 99% humidity, so maybe only near perfection. 5. Share an anti-resolution...that is, something you plan to keep on doing in the new year? Saying no to the unimportant. I've done a lot of serious thinking these past couple of months, about what my life looks like, trying to identify the stuff that isn't working and to fill my days with more of what will matter in the grand scheme. eh...not really. I mean I like it in an actual radiant orchid, but in my house or closet no. I prefer the deeper more vibrant shades of purple if I'm wearing or owning the color. 7. In three words or less, sum up your 2013. We took Daughter2 and her boyfriend into the city on Monday, and guess what? We weren't the only ones-ha! It only took us forty minutes to find a parking space, but it was a good one, so there's that. We started out in Bryant Park which always has a gorgeous tree. I like it almost as much as the one in Rockefeller Plaza. We ended the evening on Top of the Rock. I think the Empire State Building looks so pretty all decked out in her Christmas colors. May your 2014 be chock-a-block full of peace, love, and joy! Your questions this week, for me, were tough ones. And yet you answered your own with style and deep thought!! Love the Empire State Building with Christmas lights, but I wanna know what the three dots in the sky are [behind near the horizon]. Happy New Year and know you're appreciated hosting W. Hodgepodge. 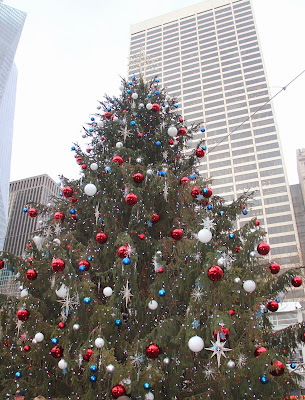 I like the Bryant Park tree just has much too! We saw the Rockefeller Center tree but can never get near it for a picture. I am humbled by your "Three Words" answer. Mine was more self centered. Yours was more positive and encouraging. A very Happy New Year to you dear lady and of course Hubs and your two daughters. May God lavish His blessings upon all of you! Great questions and answers and so sorry I was unable to participate, but daughter and Grandson are still here and I couldn't work it all in. See you next week! Ohhhh, your answer for #4 matches mine and makes me want to go back to the beach for some yummy, yummy seafood! I'm so glad you conquered exercise, that is one I have to do this year! Great choice on your three words or less, absolutely true. We just talked about being in New York City for New Year's although I think I need a year there because I want to see fireworks, I want to see Central Park in the Fall, I want to see all the Christmas decorations too besides all the other awesome things to see. Happy New Year Joyce, I really enjoyed reading your answers. Thank you for hosting Hodge Podge. My Wednesdays are wonderful because of your questions. Look forward to more in 2014. Happy New Year Joyce... hope you have a healthy and prosperous year. Had to chuckle at your comment about Boot Camp. I find that I really do like to exercise...but mostly after the fact. The knowledge that you're doing something healthy for yourself is worth it! I sometimes wish we lived near the Big Apple for just these times! It would be fun to go in as wanted... even with the traffic. Somehow I didn't realize there was going to be a Hodgepodge today. Love your answers, especially #7!! Happy New Year and I'll be back next week to play. Joyce, thank you for your questions every week. I hope that you and your family have a prosperous new year. "Jesus never fails" -- a great summation of 2013. (wish I'd said that!) Happy New Year! I am super seriously excited about that color of the year. It happens to be the color I look my very best in and it's nearly impossible to find. Maybe now it will pop up everywhere and I can stock up! Can't imagine it in my home decor though. I am so impressed with you about the whole boot camp thing! It's hard to remember how hot it was this summer, especially when it was 8 degrees yesterday. Thank you so much for hosting The Wednesday Hodgepodge, here's to a 2014 chock full of hodgepodging and hodpodgers!!! #4 = perfection, yes indeed! The Secret Life of Walter Mitty. And Me.